Matchmaker.com is one of the oldest dating sites on the web. The Matchmaker dating site began in 1986 as a bulletin-board style classifieds system—and now it houses over two million members with 50,000 new members joining every week. Matchmaker’s general demographic is aged late twenties to early forties, professional, educated, and marriage-minded. 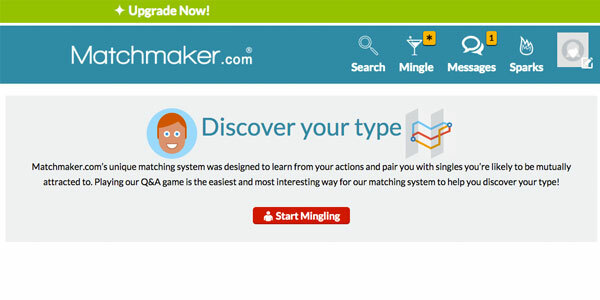 Matchmaker.com encourages interactions that go deeper than surface level with its in-depth matching system and probing Essay and Q&A profile sections. Matchmaker.com has all the basic dating site features, but they’ve elevated them to make them more intuitive and imitative of real-world dating scenarios. The icons present on all pictures and updates from members allow you to favorite or like a member profile, “wink” at them to flirt, or send a message. Your profile homepage has an Activity Feed similarly laid out to Facebook’s Newsfeed with a thumbnail picture, username, and updates from members who have changed their profile picture, answered a question or updated their information. This gives users a sense of who is most active, and, therefore, most serious about finding someone. Answers and preferences help the system learn who you find attractive and what qualities you’re looking for in a match. This allows for the possibility of a deeper connection that most dating sites allow. Sign up is relatively easy on Matchmaker.com. You answer the basic questions about zip code, age, and email; build a user name and password, and then you fill out your basic personal information. There are options to describe your hair and eye color, height, body type, religion, and ethnicity. Some of the options in ethnicity—like Latin—offer an additional drop-down menu so you can specify you ethnic “background,” i.e. Brazilian, Ecuadorian, etc. Matchmaker.com offers a list of “Safety Points” on their site with common sense advice for online dating. The site suggests that you not include your personal email, home address, or phone number in any initial messages with members. It also recommends that if you meet with someone in person, meet in a public, heavily populated place and inform your friends or family members of when to expect you home. 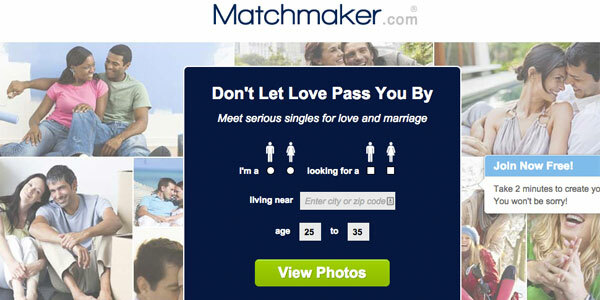 Matchmaker.com is free, but it does offer special perks and features for upgraded members. Upgraded members have their profiles shown first in the rankings and have more access to their messages. A 1-year upgrade is $11.66 a month or one payment of $113.95. If you prefer something more short term, you have 3 options. For 6 months you can pay $16.66 a month or one payement of $99.99. The 3-month option is $23.32 monthly or one payment of $69.95. Finally, the 1-month will cost $34.95 a month. Payment can be made with credit card or PayPal through an encrypted payment system.Your upgraded subscription automatically renews at the end of your selected period until you cancel your upgrade or your membership. 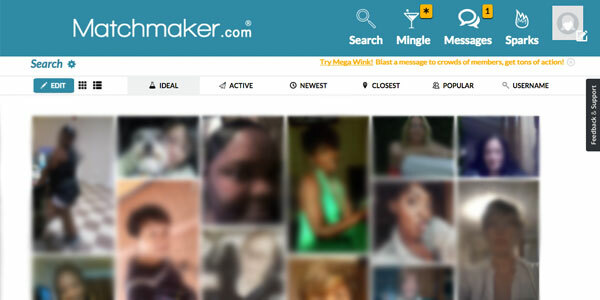 Matchmaker’s interface is attractive and easy to use. The clean and welcoming design is very pleasant, as well as the upscale user experience. The goal of the design seems to be for ease of customization and search, which makes finding the right person that much easier. All the icons and functions are intuitive and easy to navigate. The website has a responsive design, and the mobile Matchmaker.comis equally easy to navigate. The search function on Matchmaker.com brings up pages of members that you can sort based on activity, how close they are to you, their popularity, or username. Advanced search options allow you to narrow you search beyond location and gender to queries like Appearance, Background, and Lifestyle. These categories include specifics like religion, smoking preferences, whether or not a member has children and their body type. A unique search feature that Matchmaker.com employs is the ability to search by keyword. The keyword search allows you to find potential matches through specific interests, social and political preferences, or unique activities. Matchmaker.com has an enormous database of members from which to choose, which makes your likelihood of finding that special someone much higher. The design and layout of the site are well executed and easy to use. The best feature is their learning “Mingle” system. The presentation makes it feel like a game and the accuracy of their match recommendations visibly improve the more you use it. However, if you don’t feel like Matchmaker.com is the right website for your online dating preferences, try our review of Zoosk.com.